A minor basilica (Latin: Basilica minor, Basilicæ minores in plural) is a Catholic church building that has been granted the title of basilica by the Holy See or immemorial custom. Presently, the authorising decree is granted by the Pope through the Congregation for Divine Worship and the Discipline of the Sacraments. In relation to churches, writers on architecture use the term "basilica" to describe a church built in a particular style. The early Christian purpose-built cathedral basilica of the bishop was in this style, constructed on the model of the semi-public secular basilicas, and its growth in size and importance signalled the gradual transfer of civic power into episcopal hands, which was under way in the 5th century. In the 18th century, the term took on a canonical sense, unrelated to this architectural style. Basilicas in this canonical sense are divided into major ("greater") and minor basilicas. Today only four, all in Rome, are classified as major basilicas. Privileges previously attached to the status of basilica included a certain precedence before other churches, the right of the conopaeum (a baldachin resembling an umbrella; also called umbraculum, ombrellino, papilio, sinicchio, etc.) and the bell (tintinnabulum), which were carried side by side in procession at the head of the clergy on state occasions, and the wearing of a cappa magna by the canons or secular members of the collegiate chapter when assisting at the Divine Office. In the case of major basilicas these umbraculae were made of cloth of gold and red velvet, while those of minor basilicas were of yellow and red silk—the colours traditionally associated with both the Papal See and the city of Rome. These external signs, except that of the cappa magna, are sometimes still seen in basilicas, but the latest regulations of the Holy See on the matter, issued in 1989, make no mention of them. The status of being a basilica now confers only two material privileges: the right to include the papal symbol of the crossed keys on a basilica's banners, furnishings and seal, and the right of the rector of the basilica to wear a distinctive mozzetta over his surplice. The other privileges now granted concern the liturgy of the celebration of the concession of the title of basilica, and the granting of a plenary indulgence on certain days to those who pray in the basilica. The document imposes on basilicas the obligation to celebrate the liturgy with special care, and requires that a church for which a grant of the title is requested should have been liturgically dedicated to God and be outstanding as a center of active and pastoral liturgy, setting an example for others. It should be sufficiently large and with an ample sanctuary. It should be renowned for history, relics or sacred images, and should be served by a sufficient number of priests and other ministers and by an adequate choir. Many basilicas are notable churches, and often receive significant pilgrimages. In December 2009 the Basilica of Our Lady of Guadalupe in Mexico set a record with 6.1 million pilgrims in two days for the feast of Our Lady of Guadalupe. As of November 15, 2017[update], there were four major basilicas and 1,757 minor basilicas in the world. Of these 1,757 minor basilicas, three have the title of papal minor basilica and four the title of pontifical minor basilica. The three papal minor basilicas are Saint Lawrence outside the Walls, Rome, and the Basilica of San Francesco d'Assisi and the Basilica of Santa Maria degli Angeli, both in Assisi. All four pontifical minor basilicas now have individual pontifical delegates. For the Bari basilica, which is a dependency of the Secretariat of State (Holy See), the pontifical delegate is the local metropolitan archbishop. For the basilicas of Loreto and Pompei, which are within their own territorial prelatures, the pontifical delegate is the local territorial prelate. Only for the Paduan basilica is the pontifical delegate (now Francesco Gioia, Archbishop Emeritus of Camerino-San Severino Marche) distinct from the local bishop (now Antonio Mattiazzo). The remaining 1,750 minor basilicas are all classified merely as such. In Torre del Greco is the Pontifical Basilica of the Holy Cross, called by that name not only on its own site, which recalls the visits to it of Pope Pius IX in 1849 and Pope John Paul II in 1990, but also in the list of the world's minor basilicas,[unreliable source?] which, however, calls it simply a minor basilica. Another such Italian church, recognized as a minor basilica, but not as a pontifical minor basilica, is the Pontificia Reale Basilica di S. Giacomo degli Spagnoli in Naples. [unreliable source?] This name, qualifying it as both pontifical and royal, is confirmed by several other sources. One pontifical basilica in Spain listed not as a pontifical minor basilica, but simply as a minor basilica,[unreliable source?] is the Pontifical Basilica of St. Michael, Madrid, the ownership of which is since 1892 vested in the Apostolic Nunciature to the Kingdom of Spain. The description "pontifical basilica" is sometimes given, perhaps without canonical justification, also to some churches that, whether pontifical or not, are not in the list of those with a right to the title of basilica. One in the town of Grumo Nevano in the province of Naples is called on the Italian Wikipedia the Pontifical Basilica of Saint Tammaro the Bishop, a designation confirmed by the inscription "Basilica Pontifica" on its façade. Others are the Pontifical Basilica of Saints Cosmas and Damian in Bitonto and the Pontifical Basilica of Our Lady of Mount Carmel in Avigliano. The minor basilicas form the vast majority, including some cathedrals, many technically parish churches, some shrines, and some abbey or convent churches. Some oratories and semi-private places of worship, have been raised to the status of a minor basilica, such as Saint Joseph's Oratory in Montreal, Quebec, Canada. The Old Basilica of Our Lady of Guadalupe, in Mexico City was the first basilica in North America, so designated by Benedict XIV in 1754. The first in the Americas north of Mexico was Notre-Dame de Québec Cathedral in Quebec City, elevated by Pius IX in 1874. The Basilica of Saint Mary in Minneapolis became the first Basilica in the United States, designated in 1926, by Pope Pius XI. In Colombia, the Las Lajas Cathedral has been a minor basilica since 1954. In Africa, the Basilica of Our Lady of Peace of Yamoussoukro, in Cote d'Ivoire is reported to be slightly larger than St Peter's Basilica. The Basilica of Our Lady of Guadalupe, in Mexico City, is second to the Vatican City on the basis of the number of pilgrims it hosts each year (between 12 and 20 million). The Sanctuary of Lourdes in France, with several basilicas, receives between 5 and 6 million pilgrims each year. There was a pronounced tendency in the 20th century to increase the number of churches that were granted the title of minor basilica. Examples among the many are the church containing Francisco Franco's tomb and those of many others in the monumental Valley of the Fallen near Madrid, the Mission San Carlos Borromeo de Carmelo, in Carmel, California, Manila Cathedral (also known as the Minor Basilica of the Immaculate Conception in Intramuros or the original Spanish settlement of Manila), and the Mission Basilica San Juan Capistrano. Towards the end of the century, stricter rules were applied and it was decided, for instance, that since cathedrals outrank basilicas in any case, the title of minor basilica would no longer be granted to them. There are seven basilicas dedicated to Saint Patrick on three continents. Lough Derg, Montreal, Ottawa, New York, Dunedin, Fremantle (Australia) and Melbourne. As of 31 December 2017[update], there were 1,768 minor basilicas (an increase from 1,476 on 26 March 2006), of which the majority are in Europe (571 in Italy alone, including all those of elevated status (papal or pontifical); 171 in France; 148 in Poland; 120 in Spain; 76 in Germany; 33 in Austria; 29 in Belgium; 27 in the Netherlands; 16 in Hungary; 15 the Czech Republic; 14 in Slovakia; 12 each in Switzerland and Portugal; 10 in Malta; 8 each in Croatia and Lithuania; 7 in Slovenia; and fewer in many other countries), many are in the Americas (85 in the United States, 69 in Brazil, 47 in Argentina, 36 in Colombia, 30 in Mexico, 25 in Canada, 16 in Venezuela, 13 in Peru, 9 in Chile, 8 in Bolivia, 5 in Uruguay, 4 in El Salvador, and smaller numbers elsewhere), and fewer are in Asia (23 in India, 15 in the Philippines, 9 in the Holy Land (Israel/Palestine), with smaller numbers elsewhere), Africa (21 in total; 4 in Ghana and several countries have one or two) and Australasia (5 in Australia and 1 in Guam). East Asia: Basilica of Our Lady of Sheshan, Shanghai, China. Gut, Benno (9 November 1968), "Domus dei - De titulo Basilicae Minoris" (PDF), Acta Apostolicae Sedis (in Latin), Vatican: Sacra Congregatio Rituum (published 1968), 60: 536–539 . Superseded by "Domus ecclesiae - De titulo Basilicae Minoris", AAS 82 (1990). Martínez Somalo, Eduardo (9 November 1989), "Domus ecclesiae - De titulo Basilicae Minoris" (PDF), Acta Apostolicae Sedis (in Latin), Vatican: Congregation for Divine Worship and the Discipline of the Sacraments (published 1990), 82: 436–440 . "Domus ecclesiae: Norms for the Granting of the Title of Minor Basilica". Adoremus.org. 1999. . English translation of the "Domus ecclesiae - De titulo Basilicae Minoris", AAS 82 (1990). ^ "Library : Minor Basilicas in the United States". www.catholicculture.org. Retrieved 2017-07-17. ^ a b c 31, The Editors December; 2007 (2007-12-31). "Domus ecclesiae". Adoremus Bulletin. Retrieved 2017-07-17. ^ "Basilicas in the World". G Catholic. Retrieved 16 November 2017. ^ a b "Basilicas in Italy, Vatican City State, San Marino". www.gcatholic.org. Retrieved 2017-07-17. ^ "Book on Basilicas". www.gcatholic.org. Retrieved 2017-07-17. ^ "Commission of Cardinals for the Pontifical Shrines of Pompeii, Loreto and Bari". GCatholic. Retrieved 2017-07-17. ^ "Storia". Arcidiocesi di Bari-Bitonto (in Italian). Retrieved 2017-07-17. ^ "Basilica di S. Croce, Torre del Greco, Napoli, Italy". www.gcatholic.org. Retrieved 2017-07-17. ^ "Pontificia Reale Basilica di S. Giacomo degli Spagnoli, Napoli, Napoli, Italy". www.gcatholic.org. Retrieved 2017-07-17. ^ "PONTIFICIA REALE BASILICA DI SAN GIACOMO DEGLI SPAGNOLI a NAPOLI". www.napoligrafia.it (in Italian). Retrieved 2017-07-17. ^ Eisenbichler, Konrad (2004). The Cultural World of Eleanora Di Toledo, Duchess of Florence and Siena. Ashgate. ISBN 9780754637745. ^ Cirillo, Ornella (2008). Carlo Vanvitelli: architettura e città nella seconda metà del Settecento (in Italian). Alinea Editrice. ISBN 9788860553096. ^ "Basílica Pontificia de San Miguel, Madrid, Madrid, Spain". www.gcatholic.org. Retrieved 2017-07-17. ^ "Basilica Cattedrale Patriachale di S. Marco, Venezia, Venezia, Italy". www.gcatholic.org. Retrieved 2017-07-17. ^ "Antigua Basílica de Nuestra Señora de Guadalupe, Ciudad de México, Distrito Federal, Mexico". www.gcatholic.org. Retrieved 2017-07-17. ^ Guinness World Records lists Basilica of Our Lady of Peace of Yamoussoukro as the largest church in the world, having surpassed the previous record holder, St. Peter's Basilica, upon completion. It has an area of 30,000 sq metres (322,917 sq ft) and is 158 m (518 ft) high. However, it also includes a rectory and a villa (counted in the overall area), which are not strictly part of the church, and it can accommodate 18,000 worshipers, compared to 60,000 for St. Peter's. ^ Septién, Jaime (11 December 2007). "Our Lady of Guadalupe Attracting Record Numbers". Zenit. Retrieved 12 December 2009. Look up basilica in Wiktionary, the free dictionary. List of All Major, Patriarchal and Minor Basilicas & statistics by Giga-Catholic Information. 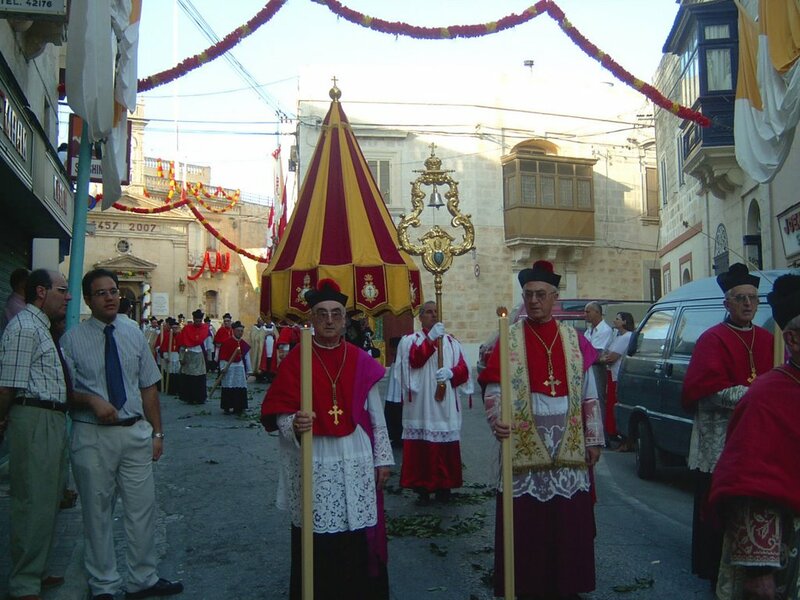 Procession with the conopaeum and tintinnabulum by the collegiate chapter of the Basilica of Sts Peter and Paul in Gozo, Malta.